By 1799 a small stone-built blast furnace was working at Darlaston Green, which must have formed part of the first iron works in the town. In 1826 Richard Bills a gunlock maker of Church Street, established a furnace and foundry at Furnace Lane, Lower Green, where Heath Road is today. He made his stepson Samuel Mills a full partner on his 21st birthday in 1826, and the company became known as Bills & Mills. Richard died on 16th June, 1849, at the age of 72. Samuel took over the company in February of that year. Before Richard's death, the partnership was dissolved. From the London Gazette, 9th February, 1849. One of the blast furnaces. It stood on the northern side of the canal, and is seen here, as it was around 1870. By the 1850s the site covered over 55 acres, on both sides of the canal. The southern part between the canal and Heath Road consisted of two blast furnaces, extensive puddling furnaces, cementation kilns, foundries, a vast metal processing complex, and Brown's patent rolling mills. To the north of the canal stood the oldest of the three blast furnaces and several coal and iron ore mines. This was one of the earliest, largest, and most important iron and steel companies in South Staffordshire, and had a name for good quality iron. The company also owned a factory at Kings Hill. The furnaces were hand-filled from the top. The tall brick charging tower on the left of the drawing contains an overhead gantry, and two hoists to lift barrows of burden up to the charging platform that ran around the top of the furnace. Each barrow would have held around 15cwt. They ran on iron plate roads and had two sharp-tyred wheels that could cut through obstructions that had fallen onto the plate roads, such as pieces of coke. The barrows were hand-filled in the ore and coke pens, and dragged to the bridge of the hoist where the 'cager' would load the full barrows onto the hoist, and unload the empties. To start the hoist he rang a bell as a signal to the engine man who operated the steam engine that powered the hoist. At the top was a 'filler' who wheeled the barrows to the throat of the furnace, lowered the bell that sealed the top, and emptied the contents into the furnace. He would then close the bell. At night the furnace top and the surrounding area was lit by the waste gases burning at the 'monkey', a bypass pipe on top of the bell. The furnaces had a hot blast that was produced by a steam engine. The blast passed through large cast iron pipes that went through brick, coal fired, heating stoves. Two of them (one on either side of the furnace) can be seen in the top drawing. In between to the two chimneys on the left of the drawing is one of the engine houses. It contained two 70 hp. beam blowing engines, one of which also operated the hoist. The site had a horse-drawn narrow gauge tramway. Slag was poured into slag ladles, which were hauled by a team of three horses to the tip. Each ladle had a tipping mechanism that was operated by a quick release shackle. All sizes and shapes of iron plates and bars were produced including boiler plates, hoops, strip, tank plates, rails, wire rods and small sizes of rounds and squares. All kinds of steel were made using the cementation process and these were well known and appreciated in the market. The charging tower, blast furnace, engine house, and heating stoves. From an old postcard. Samuel Mills became a wealthy man, thanks to the success of Bills & Mills, and the earnings from his many collieries in the area. In 1855 he leased the Essington Wood Colliery which was situated on the western side of Bursnips Road, Essington. He purchased the colliery in 1860 and ran it as a separate business alongside Bills & Mills. The company eventually employed around 2,000 people. 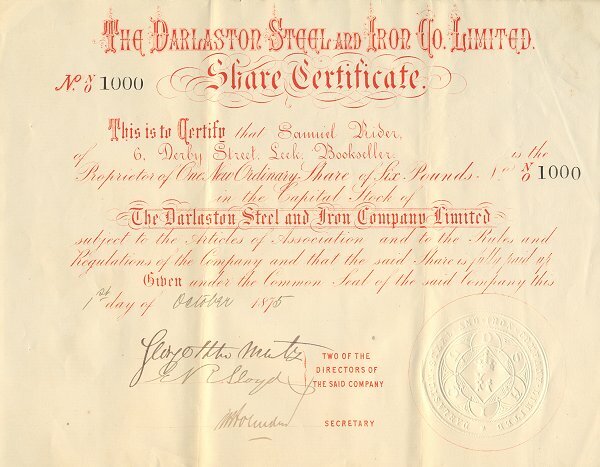 On 3rd August, 1863 Samuel Mills sold the ironworks, collieries, and plant to Samuel Lloyd, Joseph Foster Lloyd, Wilson Lloyd, and William Henry Lloyd, for a quarter of a million pounds, which led to the formation of the Darlaston Steel and Iron Company. The Darlaston Steel & Iron Company's works between the canal and Heath Road. Mr. Sampson Lloyd of Wassel Grove, Stourbridge became company Chairman with Mr. Francis Lloyd as Managing Director. 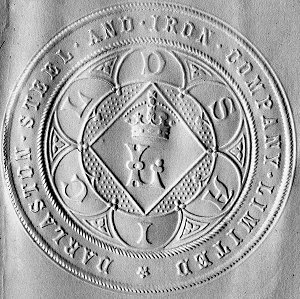 The business was re-registered as the Darlaston Steel and Iron Company on 7th November, 1872 and rapidly expanded. The number of puddling furnaces grew to 43 with 17 reheating furnaces, 8 rolling mills, a drawing-out forge, 63 steam engines, including the three 70h.p. blast engines for the blast furnaces, and rails, which were laid to all parts of the works. The rolling mills required very little manual labour and could automatically roll enormous quantities of strip in great lengths using Brown's patent process, where the strip being rolled is automatically passed through a second pair of rolls to complete the work. There were two of Casson's patent puddling furnaces and a Griffiths mechanical puddling machine, which worked well together. The company's collieries and mines, mining a 12 yards thick seam, covered 850 acres, 350 of which were freehold and 500 leasehold. Some of the seams produced what was called "Brooch" coal and others "Heathen" coal. There were also ironstone mines thanks to thick seams of "Gubbin" ironstone, "New Mine", Whitestone", and "Blue Flats" ore.
Another of the blast furnaces. After the closure, Francis Lloyd brought a disused timber yard at James Bridge, and established a small foundry which eventually became F. H. Lloyd's James Bridge Steel Works. In 1877 the Darlaston Coal and Iron Company (registered on 19th September, 1877) took over the Darlaston Steel and Iron Company's works with Ironmaster John Jones in charge. In 1878 he was replaced by E. Gem. At the same time A. E. Wenham became company secretary. The company also ran the Essington Wood Colliery which rapidly expanded with the opening of two new shafts, a coal screening plant, and a railway siding. In 1882, during the depression in the iron trade, the Darlaston Steel & Iron Company went into liquidation and was auctioned at Wednesbury Town Hall. The coal company decided to concentrate on the mining operation at Essington, where in 1891 the colliery became Holly Bank Colliery, with the formation of the Holly Bank Colliery Company Limited. The 1882 sales plan of the works. In 1883 the Darlaston site was leased to I. and T. Bradley, and B. G. and W. H. Bradley. The two newer iron-bound brick blast furnaces on the northern side of the canal continued to be used. They had a charging stage, lift, and hot air oven 43ft. long, 18ft. wide and 23ft. high. In 1891 the part between Heath Road and the canal was acquired by Charles Richards for his Imperial bolt and nut works. In 1900 the construction of a new steel-clad blast furnace began. It replaced the two stone-built furnaces on the northern side of the canal, and came into operation in 1902. By 1905 two Cowper blast heating stoves had also been added. The old heating stoves were kept as a stand-by for use in emergencies, until about 1920 when they were demolished. By the early 1900s the local iron ore would have been depleted and so scrap iron must have been used instead. In 1910 W. J. Foster joined the company as a foreman and by 1914 had become works director. 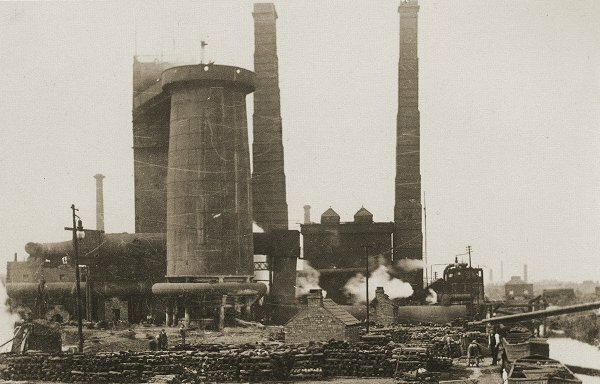 Around the end of the First World War Rubery Owen & Company built and installed a new blast plant at the works with a double bell top, inclined skip charging, and a travelling overhead crane over the ore and coke pens. The ambitious scheme was never completed because the demand for pig iron fell. The furnace remained until the late 1930s when it was dismantled for scrap. Around the same time the last surviving charging tower was demolished. 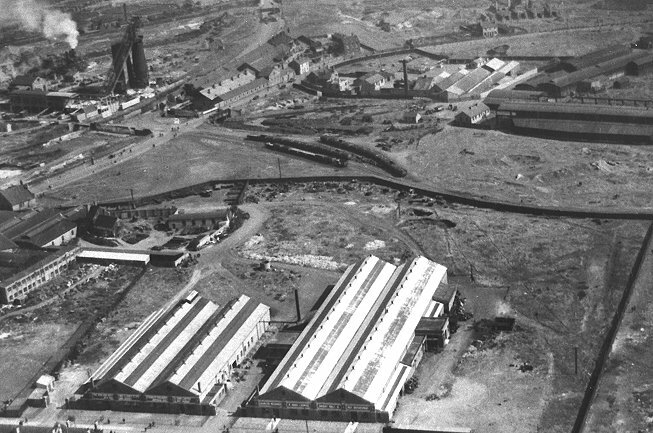 An aerial view showing the furnace built by Rubery Owen & Company. From the collection of the late Howard Madeley. 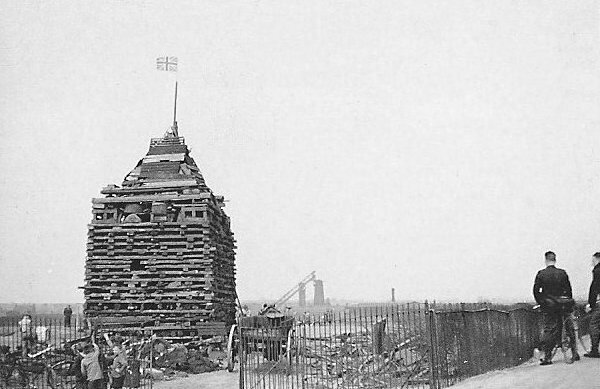 A photograph of the bonfire on The Flatts to celebrate the Coronation of King George VI on 12th May, 1937. The furnace and charging tower can be seen in the middle distance. Photographed by the late W. J. Ashmore. Courtesy of John & Christine Ashmore. A share certificate dated October 1875. The first page of the July 1873 price list. The company went into liquidation, and by the end of 1918 the site had been acquired by Messrs Tolley, Sons and Bostock who opened Darlaston Green Iron Works. The company soon demolished the oldest blast furnace on the southern side of Heath Road. Within a few years the site was acquired by G.K.N. in order to gain control of the source of their raw materials. The factory carried out all of G.K.N. 's puddling and rolling operations for their nuts, bolts and fastenings department, but by then the plant was very old fashioned and so G.K.N. temporarily closed the works. As a result the site was sold to Bradley and Foster Ltd. who were there for many years. The family lived in Darlaston House on the western end of what is now Victoria Park, where Samuel died in 1864. The house and its surrounding land occupied the modern Rectory Avenue, the Post Office, and the area behind Pardoe's Cottage, where the dovecote still stands. In the 1920s when foundations were dug for the war memorial in Victoria Road, the ground gave way to reveal part of the cellars of Darlaston House. The workmen found a number of bottles of wine, much of which was drunk there and then, although some bottles of parsnip wine did find their way to The Green Dragon in Church Street, were they went on sale. The original All Saints Church in Walsall Road was built in 1872 in memory of Samuel Mills, who died in 1864. Jane Mills, one of Samuel's daughters, was a public spirited lady who did much for the town. She founded the Jane Mills Institute in Rectory Avenue, in connection with the Parish Church to help the needy women and girls of the town. The building housed the institute and was given to the town when Jane moved to Whitton Court, Whitton, near Ludlow, in the late 1890s. The institute, later known as the "Mothers Meeting and Girl's Institute" eventually became a clinic and later "The Sons of Rest". The building is now a family home. Rough Hay Furnace & Foundry, Darlaston Green, was founded on 27th August, 1842 by Edward Addenbrooke Addenbrooke of Kingswinford, Thomas Smith of Cheltenham, and Charles Pidcock of Worcester. The firm was managed by Edward and two of his sons, John and George Addenbrooke. The firm traded as Addenbrooke, Smith & Pidcock, coal and iron masters. The family was descended from the Addenbrookes of Wollaston Hall, Stourbridge. Their father, Edward Addenbrooke, and grandfather, John Addenbrooke Homfray were both ironmasters. John and George Addenbrooke were descended from a long line of ironmasters going back to the early 18th century. It started with their great, great grandfather Francis Homfray who owned two forges, and a slitting mill in South Staffordshire. The family lived in style at Wollaston Hall which stood on the western side of Stourbridge. John and George had family links with the huge iron industry in South Wales. Their great grandfather's brother Francis Homfray had three sons, Samuel, Thomas and Jeremiah. Samuel and Thomas founded a large iron works at Penydarren, on the banks of the Morlais Brook. They also built a mansion nearby called Penydarren House. Samuel is best remembered as the promoter of Richard Trevithick's Penydarren locomotive, the first locomotive in the world to run successfully on a railway. The test took place on the Merthyr Tramway which ran for 9½ miles from Merthyr to Abercynon. It managed to haul five wagons carrying ten tons of iron, and seventy men, at a speed of five miles an hour. Samuel was one of the main promoters of the Glamorgan Canal, and founder of the Tradegar Ironworks. He became High Sheriff of Monmouthshire in 1813, and in June 1818 became Member of Parliament for Stafford. His brother Jeremiah was one of the founders of the Ebbw Vale Ironworks. In 1787 John and George's grandfather John Addenbrooke (Homfray) and his cousin Francis obtained a lease for Lightmoor Ironworks which had two furnaces, and stood roughly halfway between Dawley and Ironbridge. In 1797 they obtained a lease for the Lightmoor coal mines, and also ran the Little Dawley coal mines. They operated the Little Dawley mines until 1822, and Lightmoor Ironworks until 1839. Francis was also a partner at Calcutts Ironworks near Broseley, Shropshire, where amongst other things he made cannons for the American Civil War. As well as blast furnaces, he also owned blade mills, slitting and plating mills, finery, chafery, balling furnaces, rolling mills, and forges. John Addenbrooke's surname was originally Homfray. In 1792 he had it changed to Addenbrooke, his mothers' maiden name. Edward, John, Emma, Elizabeth, Henry, Emma, George, Thomas, Laura, Frances, and Henrietta. John was born in 1817, and George in 1825. Edward A. Addenbrooke (age 69 born Oldswinford), Iron Master employing 300 men. His wife Emma Addenbrooke (age 57 born Oldswinford). Henry Addenbrooke (age 29 born Kingswinford), Solicitor. Priscilla Addenbrooke (age 21 born Kingswinford). George Addenbrooke (age 25 born Kingswinford), Iron Master. Thomas Addenbrooke (age 24 born Kingswinford), Solicitor. Laura Addenbrooke (age 22 born Kingswinford). For several years Edward Addenbrooke Addenbrooke and three of his sons, Edward, Henry, and John ran the Moorcroft Ironworks at Bradley, which had two furnaces, and produced around 100 tons of iron each week. They also ran Moorcroft Colliery and Bradley Hall Colliery, both linked to the ironworks by tramways. The businesses were sold in 1841. Their ironworks at Rough Hay, Darlaston, founded on 27th August, 1842, became very successful. The brothers developed and patented a system for extracting hot combustible gases from the top of the furnaces, and used them to heat the air for the blast, and to generate steam for the blast engine, which also operated the hoist to lift the coal and iron ore etc. to the top of the furnace. This technique enabled iron to be produced more quickly and cheaply, because the furnace remained at full operating temperature during the blast. They also developed calcining kilns in which the iron ore was heated by coal fires to heat the iron ore before smelting. The process, which removed carbon dioxide and water from the ore, and oxidised it, was much cheaper to run than the traditional method, in which the ore was calcined in open mounds. George Addenbrooke married Matilda Louise Westwood at Wombourne in 1854. They lived at Greenhill House in Wombourne, and their son George Leonard Addenbrooke, born in 1860 had a distinguished career in electrical engineering. John Addenbrooke married Elizabeth, and they had eleven children. In 1851 they were living in Birmingham Road, Bromsgrove, and by 1871 had moved to The Elms, Sutton Road, Walsall. In the 1881 census their address is given as Waterloo Terrace, Newhampton Road, Wolverhampton. After 1855, when Edward Addenbrooke Addenbrooke died, John and George ran the business on their own. Addenbrookes were Darlaston's second largest employer, until the business closed at the beginning of 1882, putting over 1,000 people out of work. They had three blast furnaces at Rough Hay, all traces of which have now disappeared. Their products included bar, rod and sheet iron. Addenbrooke, Smith & Pidcock also owned Rough Hay Colliery, one of the largest coal mines in the area, employing 500 people. John and George owned many collieries in the area, including a number at Leabrook in Wednesbury, and the Bedworth Coal and Iron Company Limited in Warwickshire. The business ended after the tragic death of John Addenbrooke in Wednesbury on 15th February, 1882. That morning John visited their colliery at Leabrook, close to the Great Western Railway interchange basin sidings. He was a commissioner of the South Staffordshire Mines Drainage Commission, and was anxious to attend their meeting in Wolverhampton. John hurried to catch the Wolverhampton train at Wednesbury station and took a short cut along the main line that ran from Birmingham Snow Hill to Wolverhampton Low Level (where the metro runs today). As he walked along the trackside he was struck by a passing train and died on the spot. As a result of the tragic accident, the business was put-up for sale. The contents of the works were sold in June 1882. The sale included 50 tons of casting boxes, 60 tons of pig iron, and 100 tons of scrap. The large amount of casting boxes suggests that they were from a reasonable sized foundry. No puddling equipment was included in the sale, so the factory must have produced pig iron that would have been sold to wrought iron producers. George took out several patents for his inventions, including the one opposite. Another of his inventions, that would have been extremely useful in John and George's many coal mines. Both sides of an Addenbrooke, Smith & Pidcock token. Courtesy of Joy Beasley. George is remembered by the street that is named after him; Addenbrooke Street. He was a founder member of the Darlaston Local Board (the forerunner of the council), a member of the Institute of Mechanical Engineers, and churchwarden at St. George's Church. In fact the Addenbrooke company gave the land on which St. George's vicarage was built. He died on 20th May, 1906 at the vicarage in Chalford, Stroud and was buried at St. George's Church, Darlaston. The photograph shows the demolition of a bridge and tramway in Rough Hay. The opening under the bridge was known as "The Khyber Pass" and is commemorated today by the street named "Khyber Close". The old tramway must have been the one that ran between Addenbrooke, Smith & Pidcock's factory, Rough Hay Colliery, and a canal basin. The dirt track under the bridge is now Hall Street, and the bridge beyond crosses another tramway that ran between two of the coal mines. The view looks southwest towards the Dudley-Sedgley ridge. A map showing the location of "The Khyber Pass" and Addenbrooke, Smith & Pidcock's factory, which stood roughly at the junction of Rough Hay Road and Hall Street. At each end of the lower tramway was a winding machine. There were many abandoned mine shafts and spoil heaps in the area, which would have looked very different to today's flat landscape. The council must have had an immense task clearing the area when the pre-war council estate was built. 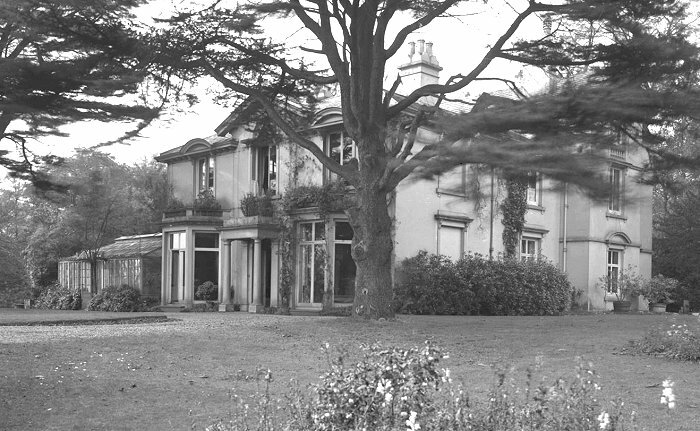 George Addenbrooke's lovely home, Greenhill House, in Wombourne. The Albert works were built in 1827 and run by David Rose. The Moxley Iron Works were founded by brothers Daniel and David Rose in 1830. Daniel retired in the early 1840s and the younger David ran both of the works. The works produced iron forgings and charcoal sheet iron of all kinds that was used for such things as boiler plates and gasometer sheets. Galvanising and corrugating were carried out on a large scale at the works and all kinds of bars including small rounds and fancy iron were produced. Other products included pan and tank plates, galvanised and corrugated sheets, and pig iron. The Victoria Works, founded by William Molineaux and James Jordan were also on the site producing strip iron for such things as locomotive and boiler tubes. The location of the works. Two blast furnaces were added in the 1840s and could turn out 20,000 tons of pig iron annually. David Rose owned a number of mines in the area and the site included a sand pit were sand was dug and sold for use in blast furnace and mill furnace bottoms. The clay from some of David's mines produced high quality fire bricks and these were one of the company's many products. The mines also contained sufficient coal to supply the works for 20 years. By the1870s there were 40 puddling and ball furnaces, 5 sheet mills, 1 plate mill, 1 bar mill, and one hoop mill. The former of these works were built twenty-one years ago, and have since been carried on by Mr. David Rose. The Moxley Works, which were formerly carried on by Messrs. Daniel and David Rose, were founded in 1830, but on the occasion of Mr. Daniel Rose retiring from business a few years ago, the whole of the property was acquired by his youngest brother, Mr. David. These works are justly celebrated for the manufacture of use iron forgings and charcoal sheet Iron. The Victoria Works are famed for the manufacture of all kinds of strip iron, notably that for locomotive and boiler tube purposes. The Albert Works, like Mr. William Rose of Batman's Hill, stand well in the market for plates and sheets, and the firm have a good old connection with engineers and machinists at home and on the continent of Europe. Two blast furnaces have recently been built here on most modern principles, and acknowledged to be the finest plant in the South Staffordshire District, and capable of turning out 20,000 tons of pig iron per annum. Mr. Rose has extensive galvanizing works here, and carries on the trade on the same premises to a large extent. Although Mr. Rose is an old ironmaster, his judgment in mines is very sound. On more than one occasion he has purchased valuable mineral property in the Black Country, and sold it at a large profit. It may be interesting to note that near the works is a valuable sand mine, largely used for blast furnaces and mill furnace bottoms. It will thus be seen that whilst the sand in being excavated forms a nice little revenue, it is a valuable adjunct to the works for the deposit of cinders and ashes. The mines of coal and ironstone here, and at an adjoining colliery of about 100 acres in extent, are also very prolific. 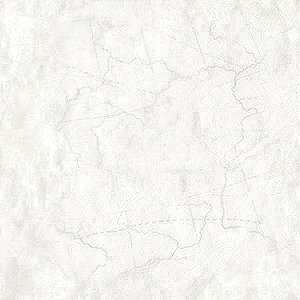 Clay for the manufacture of fire-bricks is also raised, and the quality is very superior. It is estimated that there is sufficient coal for the supply of the works for at least twenty years. This is a most unique and valuable property, for Mr. David Rose, of Moxley, digs his own coal, sand and fire clay, makes his own pigs and fire-bricks, puddles his own iron, makes and galvanizes his own sheet iron, and, we believe, raises a large portion of the ironstone to make the pigs. We can safely say there are no other works in England, or the world, which can boast of the same products and advantages on one and the same spot, stretching over an area of comparatively only a few acres of ground. The works, which are connected with the London and North Western system, are entirely surrounded with a high brick wall, and are exceptionally convenient and well laid out. In all there are 40 puddling and ball furnaces, 5 sheet mills, 1 plate mill, 1 strip mill, 1 bar mill, and one hoop mill. The pig iron made here is good. Indeed all the iron made at the Moxley Works, including their galvanized sheets, stands high in the London market. A map based on the 1885 O.S. map showing the many tramways connecting the iron works to the coal mines, and sand and clay deposits. The railway line in the bottom right hand corner joins the London & North Western Railway's Darlaston Branch, near the junction of Holyhead Road and Portway Road. A plan of the Russian Colliery. The Russian Colliery was founded and operated by the Rose family. 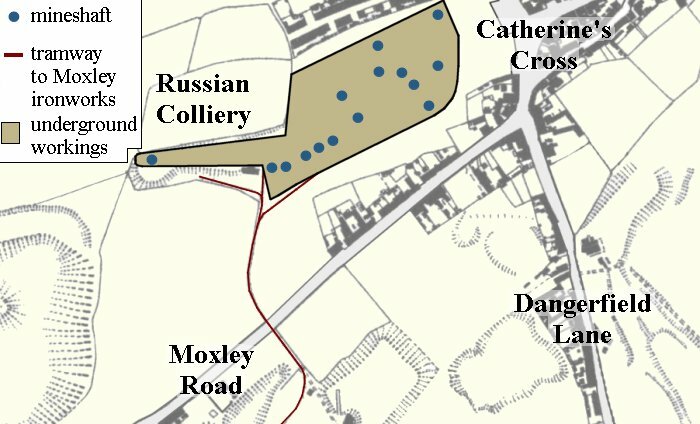 I first came across the name Russian Colliery as a child, and have since been puzzled by the name. I remember playing on the spoil heap as a child, at the top of Woods Bank Terrace. At that time the two shafts next to Shaw's scrap yard were still visible. They had been capped, but were starting to subside a little. When my mother was a child the shafts were still open, and she remembered throwing stones into them and listening for the splash as they landed in water at the bottom, far below. The puzzle about the name now seems to have been answered. One of the descendents of the Rose family is a geneticist who has been analysing his own DNA. It seems that the family is of Russian or Ukranian Jewish origin. He has matched his DNA to members of the Rosenzweig family, so at some point in time the British members of the family changed their name to Rose. Which is presumably why it was known as The Russian Colliery. Another plan of the colliery, based upon a contemporary diagram. There were fifteen shafts in all. The colliery worked from around 1855 until sometime after 1870. There was thick coal, 4.42 metres in thickness and 18 metres deep. Below this was heathen coal, 0.76 metres thick and 31 metres deep. There was also 'new mine' coal 4.15 metres thick and 68 metres deep, along with ironstone, 1 metre thick, and 43 metres deep. So the site was very productive. An advert from the early 1870s. Victoria Ironworks was acquired by William Henry Wesson in 1898 and he ran the works under the name of Wessons. William died in 1936 and is buried in the graveyard at All Saints' Church, Moxley. Wessons became known as Ductile Wesson, a part of Niagra LaSalle (UK) Limited. In January 2009 the company announced that the future of the factory was in doubt, putting around 150 jobs in the balance. A further announcement, made in February, confirmed that the factory would close by the end of the year, and 63 jobs would go by the end of April. The factory, which covered the site of both the Victoria Ironworks and the Albert Ironworks was demolished in 2011. A large scrap yard and housing estate now occupies the site of the Moxley Iron Works. 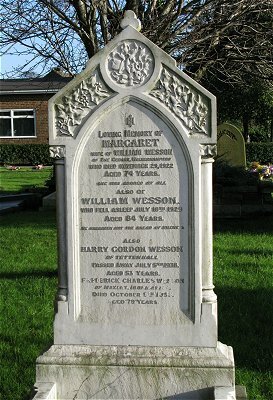 William Wesson's grave at Moxley. 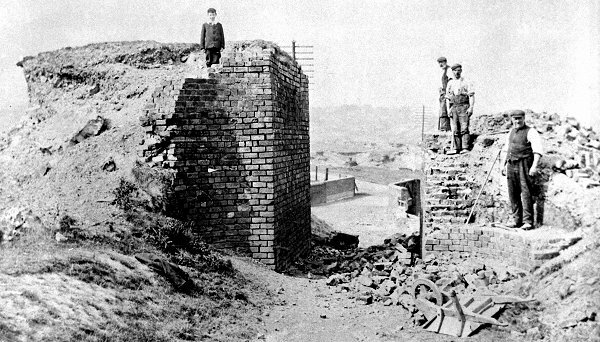 Bull's Bridge Iron Works were situated in Bull Lane, Moxley, next to Bull's Bridge on the Walsall Canal. They were owned by E. Cresswell and Sons, and put up for sale in November 1859. The factory covered just over one acre and included eleven puddling furnaces, a bar mill, twelve other furnaces, a large cinder kiln, and a 25 hp. steam engine to drive the machinery. Adjoining the main factory was a double office, a smith's shop, a store room, stable and coach house. The site was acquired by William Molineux & Company, and listed in 'Griffiths' Guide to the Iron Trade of Great Britain', published in 1873, as having 10 puddling furnaces and 2 mills and forges. The firm mainly produced sheet iron. The notice of the sale of Bull's Bridge Iron Works on 19th December, 1859.